Well this morning I just couldn't sleep ( I seem to have lots of morning where I am up way before the sun is) . I came across this wonderful applique BOM from Bunny Hill Designs called Henrietta Whisker's. I have fallen in love with it :) I spent all morning cutting and sewing the pieces for it, as soon as I find the cord to the camera I will post photo's of what I have done so far. Can't wait to see your version of the quilt. 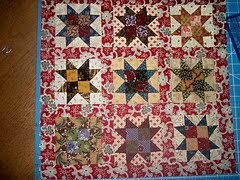 I made the free BOM last year except I have one block to make to finish the top. So pitiful.